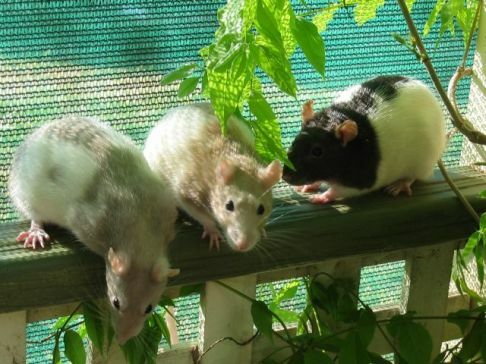 It is best to get your rat from a breeder, but that's not always possible. You can get your rat from a pet store if you know what to look for. Small pet shops are ideal because they usually take good care of the animals. Buy a rat from a clean, tidy, pet store. They usually have healthy animals. When choosing a rat, make sure the males are seperated from the females. Hold the rat up to your ear and listen for sneexing, weasing, or gasping. Don't buy a rat in these conditions. Feel the rat's belly for lumps or tomurs. Make sure they rat's eyes, ears, andnose look healthy. When you pick the rat up it should feel solid, not frail or thin. Look for bloatedness. This is a sign of illness. Finally, don't buy a rat that scratches constantly. This means that the rat has fleas or a rash. Usually its cage mates do too, so don't buy them either. Both male and female rats make good pets. But they tend to behaave differently and have different personalities. Be sure you know which one you want before you buy a rat. Males are typically larger than females. They are usually calmer and make great lap pets. If you want a rat that will just sit on you peacefully, then you should get a male. Females, on the other hand, are smaller and much more active then males. They usually can't sit still on your lap for long, and run off to explore. If you want a more active rat, then get a female. As stated before, rats are social creatures and they need companions of their own kind. It's best to keep at least two rats together. You should never have only one rat. It is proven that rats live much happier and are healthier when they live with another rats. Having two rats is no more expensive or hard thanhaving one rat, so there is no excuse for owning a single rat.